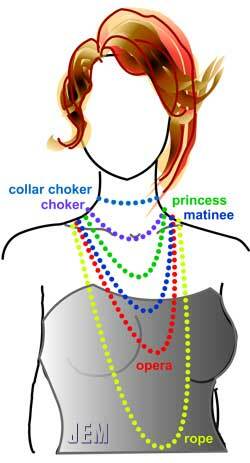 Ever wondered about what length you need for your jewellery necklace? Are there guidelines or standards? The following infomation, complied from various sources, will help you design just the length you need. princess 17-19" 43-48 cm ends a little below collar bone probably the most common length. Suits high and low necklines. matinee 20-25" 51-64 cm ends just at top of bust most popular of longer styles. Complement low & highnecklines. Formal & casual wear. opera 26-36" 66-91 cm over bustline versatile: can be worn in single strand or doubled over. Can be knotted at neckline or above bust, etc. lariat 48++ " 122++ cm very long like the rope, it usually has no clasp. One end loops through the other.